In 2011 the Babungo Foundation found a sponsor in Net4Kids who agreed to sponsor 100 underprivileged children in Babungo. BIMEHC is executing the project, following the children on their academic performances and has organised for the second time in a row a successful summer camp. The children have enjoyed a 2 week stay in BIMEHC where they have participated in different kind of activities. Facilitators in arts, music, sport and extra curricular activities have kept them occupied in a joyous manner. Excursions to the Ndwara tea estate, a boat ride on lake Bamendjin and the Prespot pottery were definitely highlights for those children. For all the children (no exception) this was their first time to visit any sightings outside their own village. The provision of good balanced food, singing, dancing and playing together at the summer camp was an unforgettable experience. The school fees, uniforms, books for those children are paid for. Teachers receive a salary to ensure the continuance of the educational programme. The children have also received Waka Waka solar lamps which enables them to study at home and no longer depend on the dangerous and expensive petroleum bushlamps. The children also get an annual health check up at BIMEHC and they have all been consulted by eye doctors. The follow up will be done in march 2013 for the children who were assessed and had eye problems. Children from poor and deprived families are now given the opportunity to get a better chance in life through their education. To provide the community access to basic education BIMEHC has opened a new centre on its premises; Jos de Kanz, comprising of two components. The day care programme is providing 22 children a neat environment to get acquainted with education. The dedicated teachers introduce them gradually into the educational system using games, songs and toys. The children are provided with one meal a day at Jos de Kanz. After an evaluation of the Net4Kids educational programme, BIMEHC came to the conclusion that the academic performances of the children could be improved if their parents would also be literate. 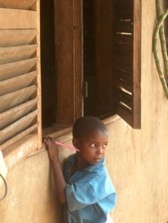 Many parents of the underprivileged homes have never been to school themselves. To improve the success of the children is seemed a good idea to help their parents as well. By starting the adult literacy in combination with a micro credit programme the women will be enabled to do calculations as well what they need to set up small businesses. The income generated will improve their livelihood. In 2012, BIMEHC went to VSO with the proposal for an adult literacy programme for 92 women in Babungo. VSO agreed and 3 areas were selected where pools were set up. In the chosen quarters Mbenjeh, Finteng and Finkwi, three times a week the participants come together to be taught in the basics of reading and writing. Hundreds of people tried to register for the programme, the interest was overwhelming but for this moment only a selection is benefiting from the the aldult literacy programme. The impact of this programme will not only be felt by the adults but their children will benefit as well. The parents will now have the possibility to help their children with their homework and see the importance of education more. We hope that in the nearby future we will find funding to extend the adult literacy programme.